Easily recognised by their distinctive turquoise sweatshirts, Beaver Scouts enjoy making friends, playing games, going on visits and helping others. They usually meet together once a week in the Beaver Scout Colony. 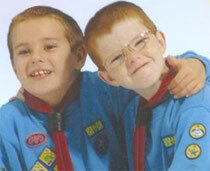 We hope you enjoy joining Beavers. We will enrol you into Beavers about six weeks after your first meeting as long as you are hppy with us and we are happy for you to join. To help you join in here are the Beaver Yell, Promise and Prayer that we say every time we meet. Don't worry, you don't have to learn them off by heart as we say the Yell and Promise together and read the Prayer out. We are Beavers, can't you see? B. E. A. V. E. R. S.
Here at Beavers and everywhere. If an adult leader raises their arm into the air this is the sgnal for everybody to stop what they are doing, including talking, and raise thair arm to show that they are ready to listen. We don't slide on the hall floor; we know it's fun but you will hurt your knees. If you hear 3 long blows of the whistle, this is our firm alarm - STOP immediately and leave the building with everybody else. If we have games outside we only go on the car parking area, the grass is out of bounds as there is a steep slope. We also do not climb on the church walls. When we are listening to each other, when we are sharing news or information or listening to instructions, only one person speaks at a time so that everyone can hear what is being said. This is polite and also keeps you safe as the instructions could be important. Would your son or daughter like to join our Beaver Colony? Would you be interested in helping with our Colony? Please get in touch and let us know by using our contacts page.